At Peterhead Flowers we only use the freshest flowers in our beautiful hand tied bouquets, because we want everything we create to be of the highest standard possible. 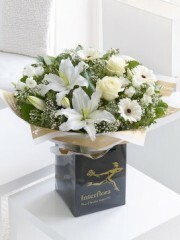 Our dedicated Florists in Peterhead create stunning hand tied bouquets for every occasion, whether it is a birthday, anniversary, congratulations, thank you or just to treat someone special. We have a wide range of flowers to choose from and pride ourselves on the variety we have available, so you are sure to find something that is perfect to suit your recipient and the occasion. 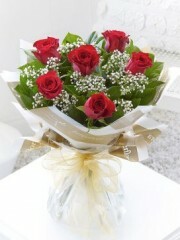 Flowers Peterhead have a wonderful selection of different designs and styles on our website, but if you cannot find what you are looking for, or if you would like something a bit more personal and unique then we can make up a hand tied bouquet exactly to your specifications. You can decide the size, colour and variety of your flowers, and our expert Florists will be on hand to advise you of what flowers are in season. If your loved one has a favourite flower or colour then we can make up a hand tied bouquet to include these so that your recipient will know just how much you care. Our Peterhead Florists make everything to order so that it is fresh and vibrant, and they have a true passion for flowers and artistic flair that will shine through and really give your hand tied bouquet the WOW factor. To guarantee the amazing quality and freshness of all of our flowers we import them directly from their site of cultivation in Holland. Dutch flowers truly are the best available and we want to ensure that everything we make is exquisite and leaves our customers completely satisfied. By using the freshest flowers we can guarantee that our hand tied bouquets will last longer so that your recipient can enjoy their flowers for as long as possible. Our customers are our top priority here at Peterhead Flowers and we want you to be delighted with everything that you order from us and with our service. 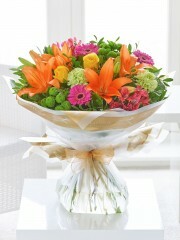 We offer a delivery service so that you can send beautiful flowers to your friends and loved ones from the comfort of your own home. This service is fantastic if you are busy and do not have time to shop about for a gift; you can buy everything that you need to treat that special someone all from Peterhead Florists and we will deliver it straight to their door. We have a wide array of gifts that can be delivered with your flowers that will make the order extra special, or can even be sent by themselves. We have chocolates, balloons, teddies, champagnes and wines, gift sets and fruit baskets for your friends who are feeling under the weather, so you are sure to find something to suit the event or occasions perfectly and bring a smile to your recipients face. We deliver 6 days a week throughout the UK, and our delivery service even extends to 140 countries overseas so that you can celebrate with your friends no matter where they are. We want to make it as convenient as possible for you, so just supply us with an address and we will sort the rest. You can specify exactly where and when you wish your gifts to be delivered, so you can sit back and relax. 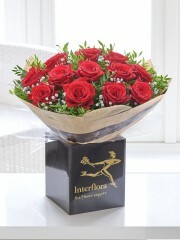 We are also delighted to offer Same Day delivery, for those unexpected occasions or if you have forgotten to order in advance, all we ask is that you place the order before 3pm so that our wonderful florists in Peterhead have enough time to ensure your order receives the care and attention that it needs and to allow our delivery drivers plenty of time to deliver your gifts in a careful manner, so that your flowers and gifts are in top condition when they are received. If you would like to place an order with Peterhead Flowers or if you have any questions or queries then please do not hesitate to contact us via phone or email and one of our team will be happy to help in any way that they can.